There is no such thing as the “perfect” home but there is a home out there that’s better for you than most of the others! If you are on the market for a house it’s easy to get excited and possibly make a choice that is not the best for your lifestyle and needs, especially your future needs. Here are nine important points to consider before you sign on the dotted line. It’s easy to forget that you will be making that monthly mortgage payment for a long time to come when you find a home that you just can’t live without. 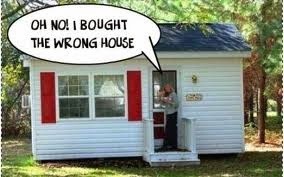 Many homebuyers make the mistake of getting in over their heads and it’s a mistake that they soon come to regret. Keep your head and no matter how nice the home is you should have a definite limit on how much you are going to spend, STICK TO IT NO MATTER WHAT. Like it or not tomorrow will definitely come and you need a home that will grow with you. An unexpected child or family member returning home can make a home seem crowded pretty quickly. Your tastes may change as well and it would be nice to have the space for your new hobby or home office. If it’s within your budget go ahead and buy that home with a spare room or two, you just might need it. There are distinct differences between the different types of homes on the market. A condo may not be the best choice for someone that loves gardening and if you hate yard work a single family home may not be your best decision. Understand what it is that you really like and look for a home that matches your tastes and lifestyle. You’ve heard the saying that age doesn’t matter as long as two people love each other, right? Well this definitely applies to house hunting. While you may not want a rundown home that was built in 1936 that doesn’t mean that you necessarily need a brand new home either. Sometimes older homes have a lot of “extras” that you might not be able to afford if you’re buying brand new. There’s also something to be said for “character”, those things which make a home truly unique. Consider both old and new and be open minded during your search. No matter how nice the interior of a home may be, don’t forget about the outside. It’s fair to say that a home situated on a very busy street may not be the ideal location for a family with children. It’s also fair to say that buying a home that’s 30 miles away from the nearest Baskin Robbins would not the best choice for some of us! Keep in mind that there are things that you enjoy outside of your home too and convenience is always a factor to be considered. Times change and our homes need to adapt as well. Consider the general layout and design of a home before you make a final decision. If you like to entertain than a small living room dining room combination may not be as enjoyable to you as separate rooms. If you enjoy cooking than obviously a small kitchen may not be your wisest choice and what outdoor chef loves a 4 X 6 yard? It seems like common sense but sometimes we miss the obvious when the rest of the home is very impressive. When you are looking for your dream house don’t consider only the possible future value if you buy today. Obviously no one wants to own a home that goes down in value over the years but who can really predict such things? Remember, your home is the place that you will return to every night for many years to come. Do you really want to relax in your “wise investment” after a long day at the office? Pick a home that you can enjoy and be comfortable in. Buy a “home”, not a “house”. Don’t forget that where you live will determine how you live. A noisy neighborhood is a noisy house. A crowded neighborhood means traffic, parking problems and possibly a lot of people that you don’t know walking around. Train tracks 200 feet away can be a big hassle (especially at 3 am) and what about that big nightclub around the corner? Is that going to be a situation on weekends? I’m not saying that any of these things are necessarily bad but depending on your personal tastes they might be. “One man’s trash is another man’s treasure” my dad used to say. Buy where you are comfortable with the surroundings. While you may love the idea of living in a Scottish Castle others may not share your enthusiasm. It may seem a long way off but someday you just might decide that the time has come to sell. I appreciate eccentricity as much as the next person but a home that seems out of place could be very difficult to sell. Be sure that the home you are considering is at least close to the other homes in the area regarding price, style and design. If not, selling it someday may prove to be a very difficult task.